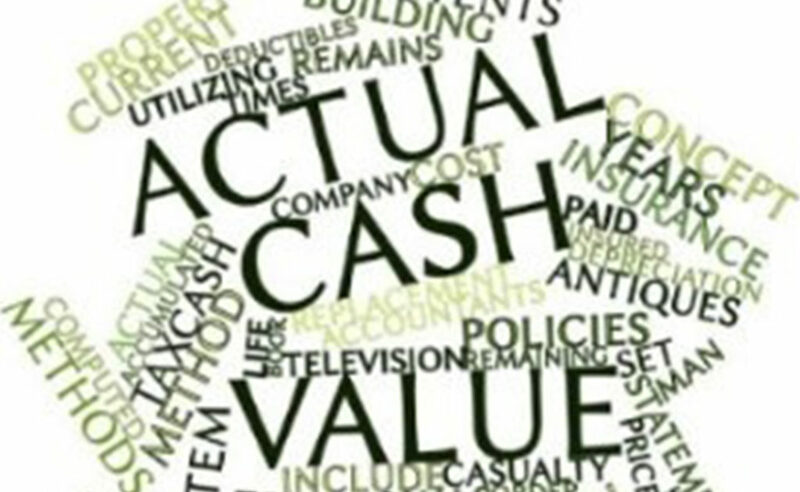 We are taking the mystery out of Replacement Cost Vs Actual Cash Value. How do replacement cost and actual cash value work in real life? “Replacement cost” and “actual cash value” are two of the most common calculations insurers use to determine the amount a customer will receive if they make a home or car insurance claim. In other words, you could either be reimbursed for the cost to replace the lost or damaged item or its actual cash value, depending on what it says in your policy. Actual cash value (or ACV) is calculated by determining an item’s original value minus the amount it has depreciated after you bought it. Replacement cost, on the other hand, is the amount of money necessary to replace damaged, destroyed, or stolen property with a new item. So, what’s the difference? And how do these calculations really apply when you make a claim? Let’s take a look. Scenario One: A pipe in your basement springs a leak and damages the sofa set you purchased 10 years ago for $1000. Your insurer informs you that the set cannot be salvaged and is damaged beyond repair. So, how much will you be reimbursed? With replacement cost: You’ll be reimbursed for the value of a new sofa set of a like kind and quality to the one that was destroyed in the flood. In this case, you may be able to purchase a new set for around $2000. With actual cash value: You’ll be reimbursed for the value of a similar 10 year old sofa set in the same condition as the one that was destroyed in the flood. In this case, you might receive around $200. At Coburn Insurance we strive to give you the best coverage available and most Homeowners policies are written on a comprehensive homeowner’s package which covers replacement cost of contents and guaranteed replacement cost on the actual dwelling. If you are unsure of your coverage please contact our office for a review of your policy. Scenario Two: A rear-end collision on your way home from work lands your two-year-old SUV in the shop. After receiving an estimate for the repairs, your insurer decides your vehicle isn’t worth repairing. How much will you be reimbursed? With replacement cost: While most car insurance policies only allow for actual cash value, some insurers may allow you to add special coverage to your policy on a brand new vehicle that takes depreciation out of the equation (similar to how guaranteed replacement cost works in home insurance). If this is part of your coverage, a settlement from your insurer could help you replace your SUV with a new version of the same model or a comparable one, or you could receive a cheque for the amount you originally paid for it. With actual cash value: You’ll be reimbursed for the amount your insurer determines you would need to buy a two-year-old SUV of a like kind and quality, in the same condition your own vehicle was in immediately before the accident occurred. In this case, you may receive around $48,000 to put towards a new vehicle, instead of the $60,000 you originally paid for it. Keep in mind that these examples are intended to give you a basic understanding of how actual cash value and replacement cost work. If you have specific questions about your own policy, speak to one of our licenced professionals. Coburn Insurance ….here to help and here to stay. Over 100 years of expert Insurance Advice.